There's so much I want to mention today, the last day of Diana Wynne Jones March. It's been a great experience and I've loved sharing it with all of you. First, I want to thank all of those who wrote guest posts for the event. Thank you to Kerry (twice! ), Sabrina, Jean, Karen, Cat, Kim and Tif! Some of the magic of Diana Wynne Jones is that she has such loyal and loving fans. Second, thank you to those who participated in the watch-alongs -- Lauren, Nina, Tasha, Sarah and Candy -- and read-alongs. Diana is definitely best when shared. 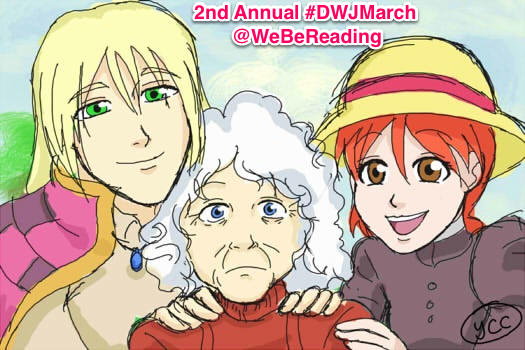 And, finally, thank you to everyone who wrote or drew or created or otherwise shared the DWJ love this month. Of course, just because March is over, we don't need to put Diana's books back on the shelf for eleven months to be neglected. Keep reading and creating and sharing and Diana will stay alive through us. Thanks so much for hosting this even, Kristen! You are a wonderful event host. Thank you, Jenny. This event never would have happened without your DWJ week! Thank you for hosting such an incredible event! I had the intention of participating in the read alongs, but school and family issues got the best of me... but I read all the posts and started reading 'Reflections', also I bought 'Fire and Hemlock' and am planning on writing my bachelor thesis on her... She is such an incredible author and someday I'll read all of her works! You're very welcome! Reading schedules don't always fit life schedules, do they? But I think it was great to raise visibility of the variety and genius of her work. And that is AWESOME that you are writing your thesis on her. I look forward to hearing how it works out for you! Thank you so much for hosting once again! It was another great month and I cannot wait to explore more DWJ later this year! !